Cancer Support Community Pasadena hosted its 27th annual Angel Gala “Shake, Rattle & Roll” last Saturday night. The event grossed more than $288,000 for the organization, with an unprecedented 372 guests in attendance and a record number of event sponsors. 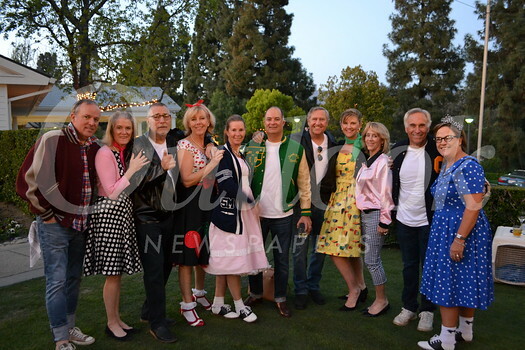 Co-chairs Stephanie and Andy Miller, Gretchen Seager and Louis Gutierrez, and Hilary and Jeff Scofield, and their gala committee, orchestrated the 1950s sock hop-themed festivities featuring a reception with silent auction, dinner, live auction and dancing. Fritz Coleman was the emcee. A surprise performance by the USC marching band was a highlight of the evening. LeAnn and Michael Healy, along with Whittier Trust, were honored with Angel Awards for their generous and consistent support of CSCP. In addition to the event co-chairs, other committee members included Melissa Alcorn, Kal Antoun, Lisa Ashworth, Michelle Chavoor, Kristin Fox, Pam Franklin, Christina Kempton, Julie Kenworth, Sally Mann, Vicky Mulligan, Diana Rafeedie-Nofal, Cindy Nuccio, Stephanie Poole, Susan Ratliff, Courtney Seiter, Suzy Sheedy, Meg Symes, Jeanne Thompson, Lydia Valenta and Tara Westwater. Cancer Support Community Pasadena provides free support groups, educational workshops, and healthy lifestyle classes to cancer patients and their families. For more information, visit cscpasadena.org.